There are a lot of great things happening here at Imagine. Last week I shared the new approach we’re taking to supporting and driving faster growth for our clients. 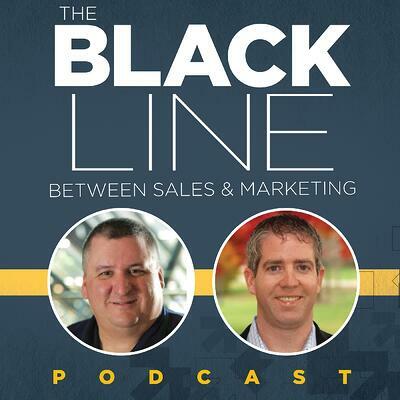 Today, I get to announce the official launch of our new podcast The Black Line Between Sales & Marketing. This time I’m hosting the podcast in conjunction with my friend, client, and vendor, Mike Donnelly, the CEO of Seventh Sense. You can subscribe to the podcast on iTunes here. What you don’t see is programming focused on challenging common wisdom, best practices and stories. Who’s looking at the story behind the story and debunking the myths that continue to pervade and interfere with the growth efforts of so many? Further, there’s no podcast that I’ve heard that presents this in a way that those people charged with the day-to-day responsibility for growth can apply to their efforts. The idea for this podcast during a late evening conversation I was having with Mike. We started talking about a sales issue he was having. The conversation led to identifying a gap in lead management. That conversation led to one of us referencing a blog post from a very popular, leading company in the sales and marketing technology space. We started talking about how misleading the post was and how much damage it does to the people reading their blog and attempting to apply its ideas. We joked with each other and said we needed to record our evening conversations so that our teams could hear how we broke down ideas and applied those ideas to strategies and execution. We also joked that our conversations were a bit like sports radio for sales and marketing. We’re often sarcastic, joke around and challenge each other to see how we back our idea up. I woke up the next morning even more excited about the idea. I often talk about the importance of business acumen, and how often it’s missing in companies. I realized that it’s the type of conversations that I was having with Mike, that I developed my business acumen. And it’s mostly how successful people gained theirs. The Black Line Podcast is a series of those conversations that take place at businesses when others aren’t around. It’s the conversation when the head of marketing and the head of sales run into each other while grabbing that last cup of coffee at 7pm when the office is empty and they break down the initiative they’ve been struggling with. It’s the conversation that takes place early in the morning between the top sales rep and the CEO about what needs to happen to accelerate results. It’s the conversation that so many people would benefit from if they only knew it was taking place at all. So I can promise you that this podcast won’t be quite as organized and formal as the podcasts you currently listen to (if you listen to any of them at all). But, if you do listen you’ll learn a lot, you’ll think a lot and you’ll have a tremendous amount of fun.